That Unity would STOP putting out so many cute sets each month! My wallet is grateful that the scrapbooking kit is every other month now........ I'm sure my husband is grateful for that too! I LOVE that they are offering 1/2 store kits now. I generally only like about 1/2 of the kits and sometimes justify buying a set just for one stamp (yes, it's true I have uninked Unity that I don't know what to do with!!). 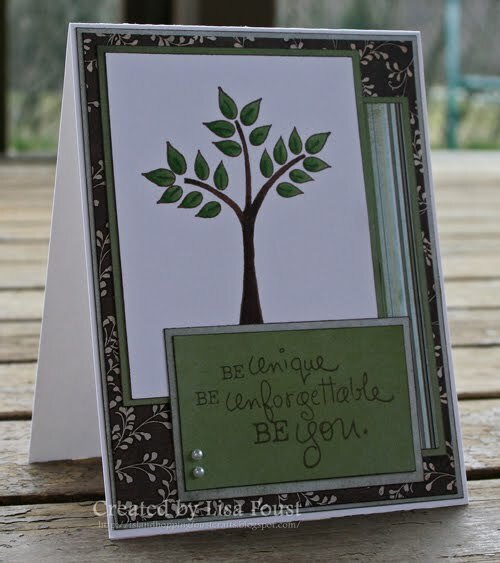 This card image/sentiment is from the May Store kit - Naturally You. I LOVE the turtle with the butterfly - but this was the first image stamp I used. I haven't inked up the turtle yet. I'm sure I will soon though! Tonight is my daughters Pre-school program. She started with this teacher in January when we moved up here and she LOVES Ms. Toni. Abby was SAD to see it end, and I'm scrambling to find a new teacher for next year. Abby did very well and Ms Toni doesn't teach 4 year olds, so I have to find someone else. I'm sad too! Toni did a wonderful job. Abby came home after the first week and was writing her name by herself (I haven't worked on it with her). I'm probably going to be crying while she's singing tonight. LOVE this card!!! So simple and so pretty!! I love anything trees & Unity trees are double love!!! Pretty card! love the tree and the quote.